Cosmetic Cupcake: An early birthday package!! My birthday isn't for another 2 weeks but I received 2 wonderful early birthday packages from my dear friend Christina this week! I always have loads of fun swapping with Christina but the packages she sent me this time were just SO extra special and were an absolute delight to open up as always!! 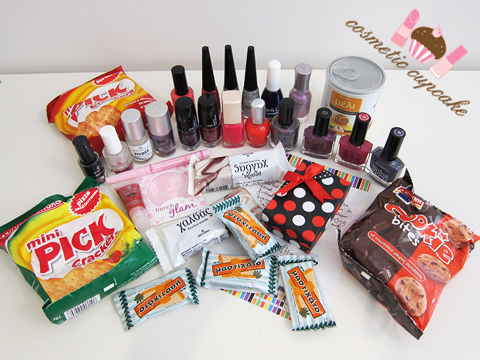 18 beautiful polishes plus yummy Greek treats too!! ^_^ OMG!! She included lots of polishes with pretty finishes that I don't have many of because I always buy the same old ones so I'm excited to try them! See the cute black and red polka gift box amongst the goodies? Christina made me 3 absolutely beautiful pieces of jewellery with nail polish as my birthday gift that I'll show you in my next post - they are simply stunning and deserve a post of their own! From L - R: Art Deco 275 and 280, Erre Due pink and red (no names), Irine 74 and Deborah Shine Tech 19 and 36. From L - R: Essence goodies! Essence Denim Wanted! 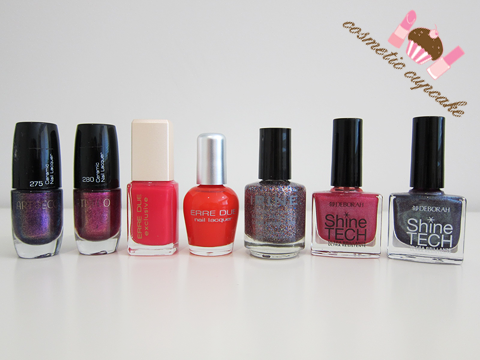 High Waist Pink, Colour & Go Fabuless, Glitter topcoat and multi dimension purple dimension. Also some French glam nail stickers, French manicure and pedicure pen and a Sparkling cherry lipgloss. From L - R: Golden Rose Nail art polishes in 109, 120 and 112, Beauty Line Cosmetics 511, Urban Decay polish and H & M Razzle Dazzle. Thank you so so very much my dearest Christina for an absolutely wonderful birthday package <3 It feels like my birthday is here already because of you! Wow you got some great products! that urban decay polish is stunning! Wow, that was very sweet of her!! 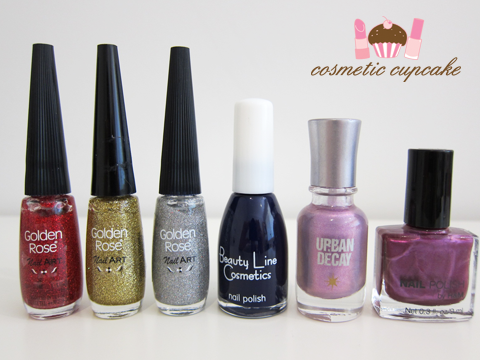 Now it's your turn to be sweet and sport some of those beauties in your next manis, LOL! What a lovely gift from what sounds like a loely friend. Enjoy! wow thats a lottsa polish!!! koolio!! Waiiiiiiiiiiiii, I am so happy you liked them my dear (and so relieved that nothing broke)! I tried to stuff as much as possible inside (with the help of my mother who is a total packing guru). This is GORGEOUS!!! What a wonderful early birthday present!! the products are from Greece!!! Happy Birthday Early!!! Awesome gift! love all this cute things!! @beauxsmom: I'm so spoiled to have so many Greek goodies now thanks to Christina! @Monique (FOREVER 1992): LOL no don't hate me! I can't help having lovely friends =) Thanks for the bday wishes hun! @Oreleona: I couldn't believe how much she sent me x) It's going to last me for ages! @Jade: LOL I definitely am. Now my family and boyfriend have to top this present when my birthday actually comes along! @Mez: Every time I receive parcels and I see it's from Greece I get so excited =D You can see why!! @xlittle.girl: The cookies were very yummy =p thanks hun!